Because they look like pale ants, and for want of a better name, the Chinese call them “white ants” (“bai ma yi” in Mandarin). The Malay name is “anai-anai”, although some are beginning to use “semut puteh” (or white ants). Termites are more closely related to the cockroaches than to ants. You are closer to truth if you call them “white” cockroaches. Of the 3 groups of termites (dampwood termites, dry wood termites and subterranean termites), the subterranean termites account for 90% of all termite-related damage. As the name suggests, subterranean termites nest in the soil and they travel in between panels, walls, steel, in fact in any crack and crevice, in their tireless search for food, which is cellulose found in timber and wood-based products. In the process they also conduct exploratory feeding, thus damaging electrical wirings and conduits although these do not contain cellulose. In their natural environment, they have an ecological role when they reduce fallen trees into nutrients for other living plants. Unfortunately they cannot distinguish between the jungle and Man’s habitat. As a result the wreak havoc in timber structures and furniture of buildings, causing millions of dollars of repairs and replacements. The main evidence you look for are the mud-shelter tubes they build over the surface of walls and panels, to lead them safely from their nest in the soil to the timber structure on which they feed. Sometimes you may hear clicking sounds made by the soldier termites knocking their large mandibles (jaws) on the timber structure, signaling danger to the other members of the colony. Given their small size and the fact that soldiers make up less than 10% of the population, the infestation is very heavy if you can hear these knocks. Often you detect their presence only after extensive damage is found. Spraying a can of aerosol insecticide will only kill the soldier and worker termites scavenging outside their nest. As a mature nest has an average of 1 million inhabitants, you are unlikely to eliminate the rest of the colony. You may instead force them to reappear in another place where you cannot detect their presence and the damage will continue undisturbed, until it is too late! Call Aardwolf Pestkare to scan your property. A thorough scan will normally detect an infestation and then a localized “spot-treatment” can be carried out. 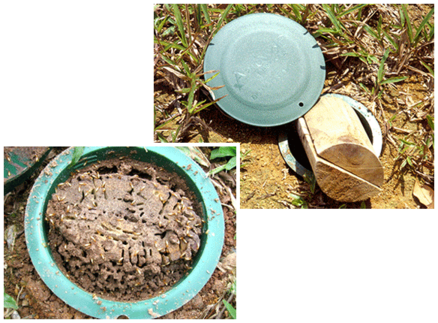 Install baiting stations to eliminate subterranean termites away from buildings and the infestation treated outdoors. A long-term protection is to termite-proof your property by creating a termiticide barrier around the building structure so that the subterranean termites will be prevented from invading. Prevention is still the best cure against subterranean termites. Under a franchise arrangement with TermiCam Australia in 2002, Aardwolf Pestkare is the first company in Asia to employ Thermal Imaging to detect Termite Infestation. A piece of equipment will remain just a tool unless it is handled by qualified professionals. Aardwolf Pestkare is proud that all its Thermographers are trained in Australia and certified by the Australian Institute for Non-Destructive Testing (AINDT). This explains why Aardwolf Pestkare’s Termite Management Programme enjoys an estimated 98% success in detecting Termite presence and entry points accurately and promptly, so that effective treatment can be carried out before further damage is caused. As proof of our reliability, Aardwolf Pestkare is the first pest management company in Singapore to offer financial protection against timber damage caused by Subterranean Termites.